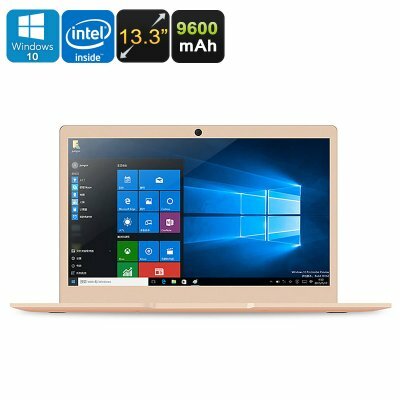 Successfully Added Jumper EZBook 3 Pro Windows Laptop - Intel Celeron N3450 CPU, 6GB DDR3 RAM, 13.3-Inch, 1080p, 9600mAh, Unlicensed Windows 10 to your Shopping Cart. The Jumper EZBook 3 Pro is a thin and stylish looking 13.3-Inch laptop that bring along great possibilities for work and entertainment alike. With its Intel Celeron N3450 Quad-Core processor and 6GB DDR3 RAM, it brings forth a lightning fast performance. It furthermore packs 64GB of eMMC storage that brings along enough memory for you to keep all your files. If you are looking for an affordable Windows laptop that lets you enjoy the latest programs and basic games without dropping a frame, this Laptop is perfect for you. Its powerful CPU combined with the Intel HD 500 graphics, delivers a free and exciting experience for both work and fun. Thanks to its sleek design and ultra-thin bezels, the EZbook Pro truly is a feast to look at. Crafted out of metal, your Windows 10 laptop (unlicensed) features a cool and high-end look and feel. Additionally, it weighs merely 1.4KG. This makes your 13.3-Inch laptop extremely portable as it lets you carry it along effortlessly anywhere you go. From now on, you’ll always be able to access your files, check your email or play games. This Windows Laptop is a great tool for working on the go or for simply playing games and browsing the web. For those of you that require more storage besides its internal memory, this Windows laptop supports 128GB external memory. Therefore, you’ll never have to worry about running out of place to store your latest downloads and files. On its stunning 13.3-Inch LED display, you’ll be able to enjoy all your favorite media and games in mesmerizing 1080p resolution. Treating you with vivid color and crisp details, you are guaranteed to undergo a high-end visual experience. Within its sleek body, the laptop computer packs an epic 9600mAh battery. Along with the energy efficient CPU, this cell brings along a full days’ worth of usage time. This means that you’ll be able to enjoy all the latest Windows 10 programs and Office features throughout the day without needing to worry about battery life. Whether you wish to use it for working on the go, watching movies, or playing games – the Jumper EZBook 3 Pro is an affordable Windows laptop that is sure to meet your demands.